Tucson Unified will be testing TUSD students 1st through 6th grade during October 15, 2018 and November 21, 2018 and kindergarten students during January 8 through January 25, 2019 to determine student eligibility to receive gifted services in the TUSD GATE program for school year 2019-20. "Invitations to Test" and "Opt Out "forms will be mailed in early September to all TUSD student families' mailing address in grades K-6th. Parents must return the invitation or notify the GATE office if they choose to have their student tested by September 21, 2018. "Opt Out" forms must be received prior to testing date. "Invitations to Test " and "Opt Out" forms will have a self-addressed envelope to return by mail or the invitations may be returned to the Cavett GATE office at 2120 E. Naco Vista. Two additional make up tests for students living within the TUSD boundaries and choosing to enroll in the TUSD GATE program, will be administered on January 26, 2019 at Hollinger K-8 School and on February 2, 2019 at Cavett Elementary School. Testing will be administered during the testing window at every elementary and middle school. Notices will be posted at each site providing the date of testing and communique will be sent home to families by individual sites. Tucson Unified administers the Cognitive Abilities Test (CogAT) and Raven Progressive Matrices to determine GATE service eligibility. Tests are administered at all district elementary and middle schools with two additional Saturday make-up tests at a central location. In August, invitations to test are mailed to all Tucson Unified families with kindergarten through sixth grade students. Permission to test forms are available on this webpage and at all district elementary and middle school sites. In the fall of each school year, the GATE department tests first through sixth grade students attending Tucson Unified schools or living within the district boundaries. Kindergarten students are tested after winter break. These tests establish eligibility for Gifted and Talented Education services for the coming school year. Students attend full time, five days a week, at a school that accommodates the feeder pattern of the home school. Pre GATE Kindergarten self-contained programs are located at Roberts/Naylor K-8, Kellond, and Wheeler Elementary School. 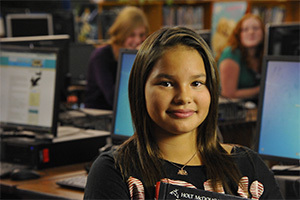 The Dual-Language self-contained program is located at Hollinger K-8 School. GATE TESTING AND PLACEMENT: Testing instructions are offered in the language that best meets the student's needs, and students are placed in the appropriate GATE program (self-contained or pull-out) based on test results. The Invitation for GATE Advanced Learning Opportunities form must be received by the GATE office in order to have your student scheduled for testing. Tully Magnet and some of our cluster sites have kindergarten-endorsed teachers able to support gifted students in their classrooms.